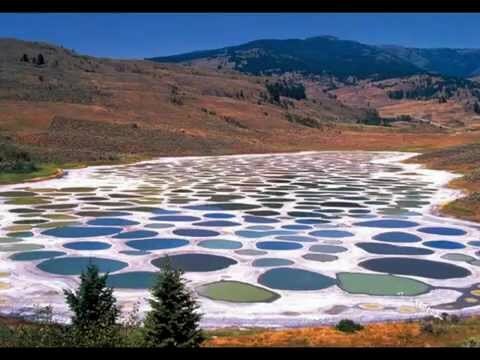 Spotted Lake is a saline endorheic alkali lake in just northwest of Osoyoos in Similkameen Valley, British Columbia, Canada. The lake itself is richly concentrated with various minerals, containing an incredibly dense deposit of magnesium, sulfate, calcium, and sodium sulphates. It also contains high concentrations of other minerals, including silver and titanium. Aside from it’s interesting mineral makeup, Spotted Lake is known for its strange appearance. Most of the lake’s water evaporates in the summer, revealing stunning mineral deposits. These look like large “spots” and are colored according to the mineral composition and amount of prior precipitation. Remaining minerals harden to form a natural walkway around and between these eerie spots. For centuries Spotted Lake was revered as a sacred sight. Hundreds of years ago, locals believed it to provide therapeutic waters. The lake’s history gets even stranger; during World War I, the minerals of Spotted Lake were used to manufacture ammunition. In the 1970s, the lake came under the control of the Ernest Smith Family, who then attempted to generate interest in a spa in the lake. In 2001, The First Nations struck a deal by purchasing the land for preservation and conservation efforts. If you visit Spotted Lake, you will see a roadside sign alerting visitors to the presence of the body of water. When visiting, be sure to read all material provided at this sign. The lake is both culturally and ecologically sensitive, continuing to provide a traditional medicine for the nearby Okanagan Syilx people. The lake can be viewed from the fence, which protects the area from the liability of public access. While you’re here, checkout the nearby town of Osoyoos—a bona fide desert with lizards, cacti, and snakes.